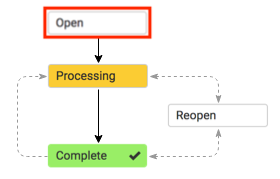 What is an Open Order? For basic reference, please see Order Status Labels. Whenever you start a new order, it begins as an Open order. It's essentially a draft, meaning the "Place Order" button has not yet been clicked (and the Terms of Sale have not yet been agreed upon). Once the order has been placed, it will change status to "Processing." An Open order is visible to the user who created it and authorized teammates, but by default, it is not visible to the other party. When you start a new Order, it begins as Open. The Buyer cannot see it initially. If you wish to send it to your Buyer in its draft state, you can use the "Send to Buyer" button at the bottom of the form. This allows them to modify any of the information inside and click "Place Order" on their end when they're done. If you don't need to send it to your Buyer to review, simply click "Place Order" and the Order will proceed and change to "Processing." When a Buyer starts a new Order, it begins as Open. The Seller cannot see it unless it qualifies as an "Abandoned Cart." The Buyer cannot send the Open order to the Seller in Brandboom, but they can generate a PDF if they wish to send their order info. Once the order is finished, the buyer clicks "Place Order" and the order will change to "Processing." The order will now appear for the Seller.